Call of Duty fans have been wondering since November how exactly Activision will make good on its promises of regular downloadable content drops for Call of Duty Elite’s Premium members. We learned last month that the first download release would be coming on January 24; a freshly e-mail press release reveals some new details about that content release and those that will follow it. January 24 is the official kickoff date for the Modern Warfare 3 Content Season, launching with two new maps that will be playable in multiplayer and Spec Ops Survival modes. 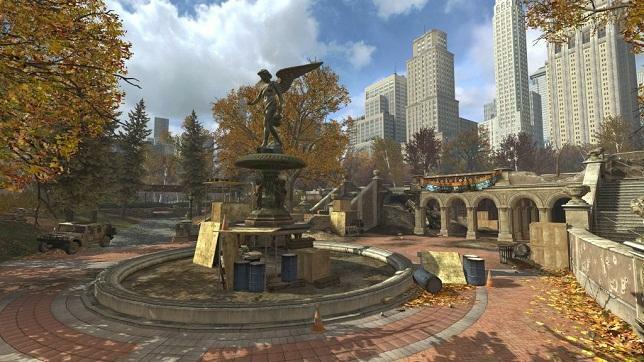 The two locations are Liberation, the previously hinted at Central Park map (pic above), and Piazza, an Italian seaside village. Bear in mind that the 1/24 content release only applies to Elite’s Premium members with Xbox 360 versions of the game. The same content will be coming to other platforms at a later time, but no timetable is specified. The next content release will happen in mid-February, and then two more will follow in March. Note that the two 1/24 maps are counted as two content drops, which means that March will likely be a similar situation. No details are provided for the February and March releases, but the press release notes that players can look forward to new Spec Ops missions and game modes in addition to the multiplayer/Survival maps. Non-premium Duty players will have to wait until March for the first Content Collection release. The Content Season will conclude in September of this year, with “at least” 20 content drops in all.